GenXPRo has forged its 10 years of experience in NGS library production in its MACE kit for 3′ End Sequencing! The MACE kit is available in a 6x version (miSeq) and a 24x (HiSeq) version and can be combined to analyse 96 or more samples simultaneously. We are glad to announce that we have signed an agreement for the distribution of our MACE kit in Japan with FUNAKOSHI, one of the leading life science traders in Japan. 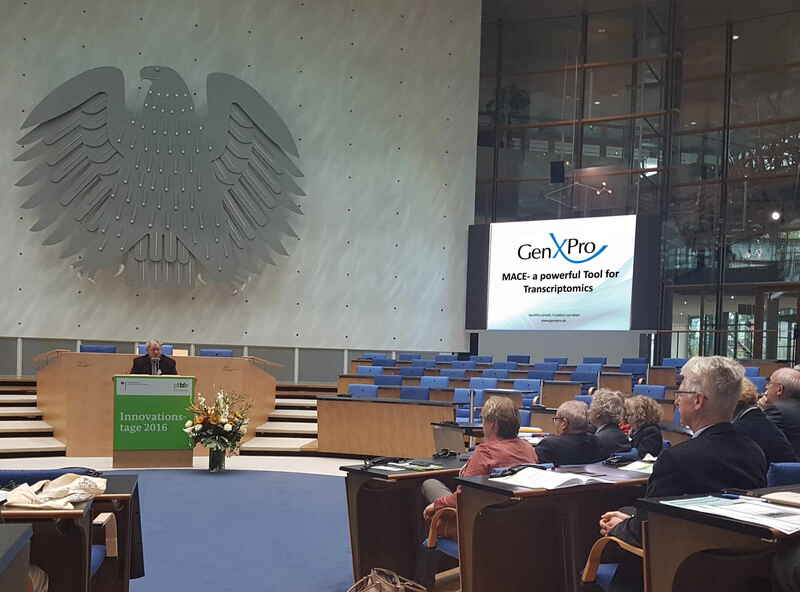 CEO Dr. Peter WInter presenting the Innovative MACE Technology at the Innovation Days 2016 in Bonn. GenXPro launches single tube, gel-free smallRNA kit for as low as 1 ng of total RNA input material. Lange CAK, Lehnert P, Boneva SK, Zhang P, Ludwig F, Boeker M, Hoffmeier K, Horres R, Schlunck G, Reinhard T, Böhringer D, Auw-Haedrich C.Increased expression of hypoxia-inducible factor-1 alpha and its impact on transcriptional changes and prognosis in malignant tumours of the ocular adnexa.Eye (Lond). 2018 Jul 31. By combining intelligent sample preparation with latest next generation sequencing methods, we analyse transcriptomes, genomes and epigenomes at highest resolution. Our service comprises project planning, consulting, sample preparation, sequencing and bioinformatics. In 2008 we invented “TrueQuant” – applying unique molecule identifiers for PCR bias reduction of NGS data. Thanks to many years of experience with deep sequencing, we have accumulated vast knowledge in low-bias sample preparation of all kinds of different biological samples and provide appropriate data analyses solutions for all areas of life sciences. Our team of bioinformaticians apply the most advanced methods and designs individual solutions to handle the data on our powerful CPU clusters in order to provide the optimal analysis pipelines for your data. Data is delivered in a ready-to-use format and includes quality information, quantification, annotation, mapping, Gene Ontology analysis, plots and other graphics. Precision Medicine, Theranostics, Liquid Biopsy, ctDNA, cfDNA, Illumina, RNAseq, deep Sequencing, massively parallel sequencing, 3’Seq, exosomes, small RNA, miRNA, micro RNA, SuperSAGE, MACE, Massive Analysis of cDNA Ends, PARE, Transcriptomics, De novo Sequencing, Assembly, SNPs, Copy Number Variations (CNVs) , RC-Seq (a variant of RADseq), Genotyping by Sequencing, GBS, Normalisation of cDNA and DNA, CpG Islands, Methylation, MethylSeq, Exome Sequencing, Target enrichment, qPCR, Bioinformatics, SMART Breeding, Tag-Seq, TagSeq, TrueQuant, UMI, Molecular Barcodes, Target sequencing of Poly-A tags, PATs, ATAC-Seq, Microbiome, Metagenome; Amplicon-Seq, small RNA sequencing from palsma, serum (blood). Our services and producs are for research use only.